From time to time, various members of our office staff will be posting on our blog, expounding on topics within their particular areas of interest and expertise. As one of the office’s resident “plant geeks,” horticulture is where the majority of my entries will focus, and with any luck they will be at least slightly more engrossing than watching paint dry! Typically we view fall as a time for the landscape to begin dormancy, as the garden settles in for its winter slumber. However, there are quite a few plants that are just hitting their stride once the air turns a little chilly. The following are two late-blooming perennials worthy of greater consideration. Tatarian Aster (Aster tataricus ‘Jindai’): Asters are one of the true kings of fall for showy bloom, and Jindai Tatarian Aster is further proof of this (photographed below alongside Switch Grass and Joe Pye Weed). Found in Japan by Rick Darke, this selection is shorter than the species at about 4’ tall. Like other Asters, this remains unassuming during the spring and summer months before putting on its big performance in the fall, with pale lavender daisy-like flowers borne above the foliage. However ‘Jindai’ has two big advantages. First, unlike other Asters that tend to look weedy during the summer, the foliage on this plant is heavier and more abundant, producing a nicer texture in the border. 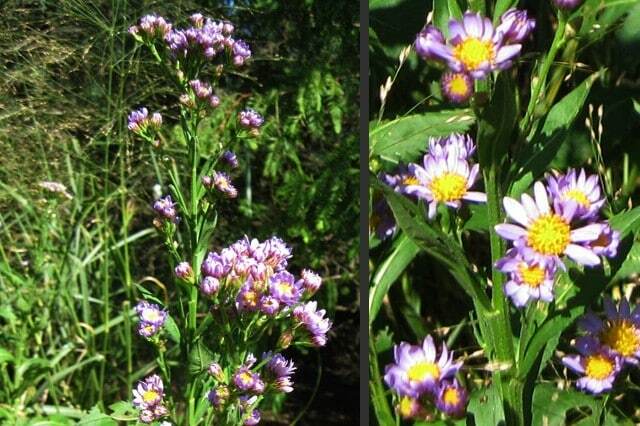 Secondly, most Asters begin to bloom in early September and are basically finished by mid-October…but not this one. ‘Jindai’ is just beginning to bloom here in mid-October, and does not stop until mid-November. This provides a nice late-season shot of color to the garden juxtaposed against fall foliage, and the blooms are enticing for last-minute butterflies to grab a snack. 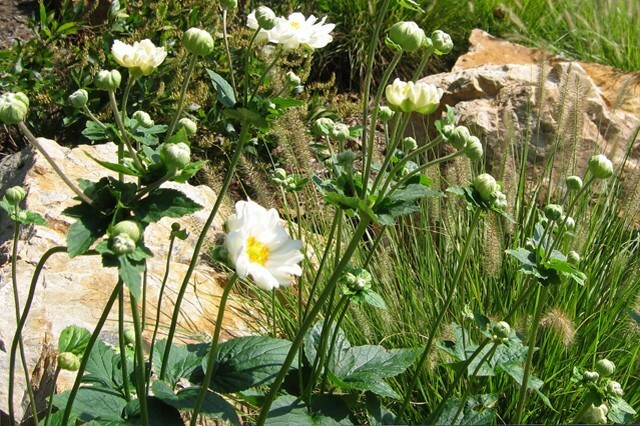 ‘Jindai’ does best in full sun and well-drained soil, but does appear somewhat tolerant of heavier soil. Hybid Anemone (Anemone x hybrid ‘Honorine Jobert’): Another exceptionally showy fall bloomer. ‘Honorine Jobert’ produces masses of pure white single blooms 2” across with yellow stamens in the centers. They tolerate a wide range of exposures, blooming in both full sun or part shade. 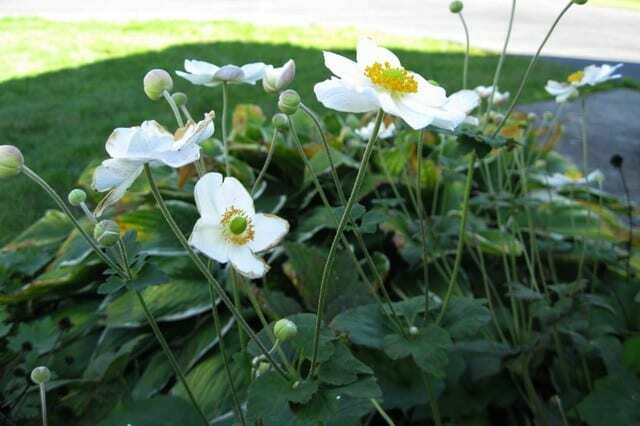 One of the last perennials to leaf out in the spring, Hybrid Anemones spread by rhizomes to form dense colonies. Give them plenty of room to spread, as they will quickly form unbroken mats of foliage. Any unwanted growth is easily removable to keep the habit of the plant in check, and plants typically respond well to spring division. Basal, three-lobed foliage is neat and tidy, and held within 18” of the ground, so they remain neutral partners to summer-blooming companion perennials. Starting around Labor Day, the plants send sinewy flower shoots above the foliage (30” – 42”), and the blooms persist until the first hard frost. It also makes an excellent cut flower.